The Muny Trolley is back this summer! Metro Transit and The Muny are partnering again this year to provide Trolley services to The Muny. The #3 Muny Trolley will serve patrons of The Muny this season on the evenings when shows are scheduled June 17 through August 11, 2013. The 3X Muny Trolley will operate between the Forest Park-DeBaliviere MetroLink Station and The Muny on 20-minute intervals from 7:22 p.m. to 8:02 pm. before the show and for two trips or more if necessary, to the station after the performance ends. The cost is $2 for adults and $1 for children ages 5 to 12. During the day, the #3 Forest Park Trolley conveniently connects area residents and tourists to all of the Forest Park attractions and the Forest Park-DeBaliviere MetroLink Station. For $2 for adults, $1 for children 5 to 12, and $1 for seniors 65 and older and disabled customers (with a valid Metro Reduced Fare Permit), visitors can ride the #3 Forest Park Trolley all day from 9 a.m. to 7 p.m. through Labor Day. Visitors don’t have to worry about driving in traffic congestion in the park, finding parking or moving their cars as they enjoy more than one attraction in the park by hopping on and off the Trolley. The #3 Forest Park Trolley conveniently drops off and picks up passengers at the front door of the park attractions. Customers purchase tickets aboard the Trolley bus and the ticket is valid for unlimited rides on a single day on this #3 Forest Park Trolley route only. All Metro tickets, passes and transfers are accepted on the route as well. The Trolley runs every 20 minutes. A schedule and map of the route for the #3 Forest Park Trolley is posted on our website. Customers can also call Metro Transit Information at 314-231-2345 or 618-271-2345 from 7:30 a.m. to 4:30 p.m. Monday through Friday for more information. 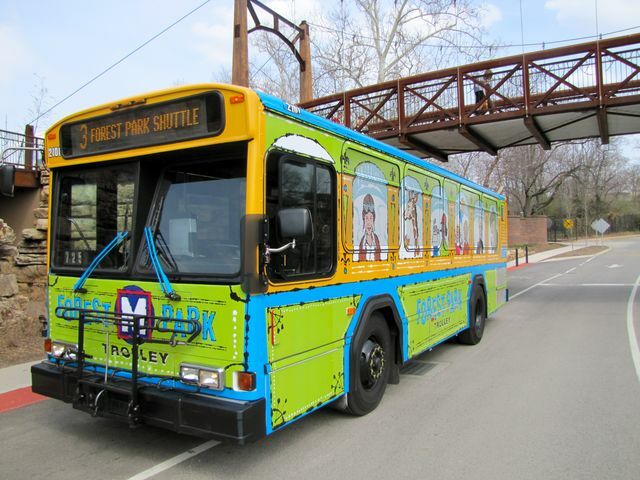 The Forest Park Trolley service is a partnership between Metro and Forest Park Forever and its Park Partners: Saint Louis Art Museum, Missouri History Museum, Saint Louis Science Center, and Saint Louis Zoo.